Hello, Gorgeous! : life in pictures: the winter hibernation. How was your weekend? Is it still ongoing because you have MLK day off tomorrow or do you have to pound the pavement in the A.M.? p.s. I know everyone gushes over their pets. But, seriously, how adorbs are my cats here?! Michigan weather has been torturously cold and staying in has felt like the thing to do. 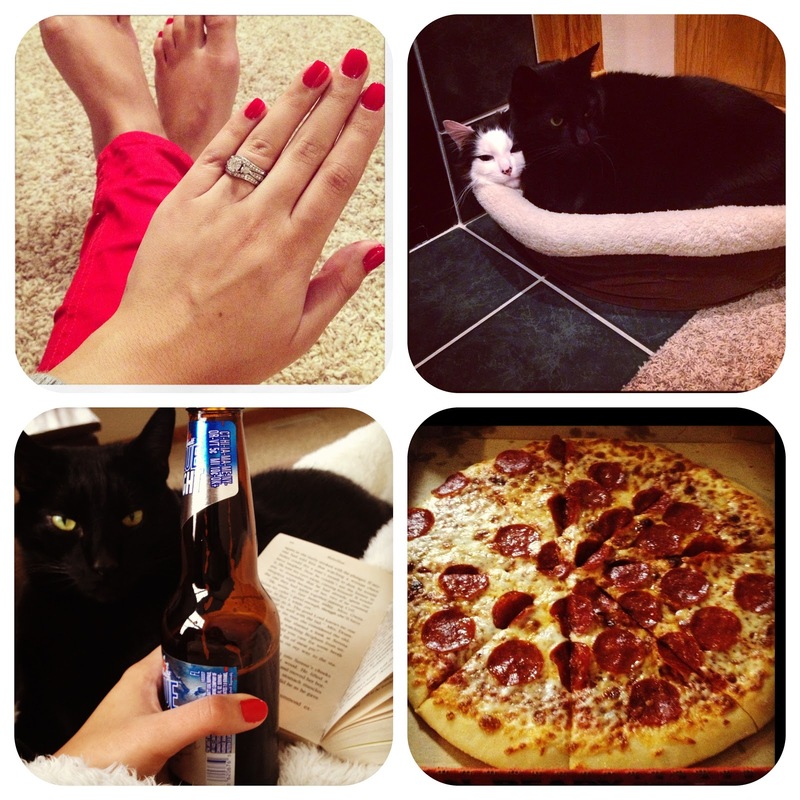 So, it's given me the perfect excuse to hang with the hubs and the kitties, eat pizza, read books, and paint my nails. Sort of like Winter hibernation-- human edition. Which I imagine to be a little like glamping. But, without the glam and without the camp. So... not like glamping at all?? In other news, not to be outdone by 98% of Americans, we too are getting on the work-out bandwagon and signing up at a new gym. The gym that I checked out seems to offer good classes and I would love to get back in the groove of working out. Believe it or not--there was once a time when I frequented the gym and not just the refrigerator! Here's to sticking to it! Uhh everything about your weekend looks heavenly. And I, too, will be doing the chores tomorrow that I should have done today, so much for a day off! Ha your cats are so cute!! I unfortunately am one of the people who has to go to work tomorrow. Blerg. Have a great day off!! Sound like you had a puuuurfect weekend, and your kitties are soooo cute. Light beer and Pizza! Sounds like a great weekend. I really enjoyed my extra day off. It was in the 70's and sunny here though! Your winters sound so rough! Yeah, for getting back to the gym. It's good for the body and heart even when you don't need to lose weight. It was insane how cold it was on Monday and Tuesday. I couldn't believe it. Where was that Saturday a few weeks ago that was in the 50's, almost 60's. We need that back! However, my January weather calendar says that it's supposed to get to the low 50's at the end of the month! But it was nice to have Monday off and go to the Henry Ford Museum! It was free too because Target paid for all the visitors that day! Hope you had a great weekend and MLK day too! Love the kitties!!!! (I won't tell you how many we have as to not embarrass myself). I love getting ideas from your blog (mostly from my own closet since I tend to spend more on my 2 little girls than myself)! Also, happy to know I'm not the only one suffering in this Michigan cold weather! SO ready for spring!! !